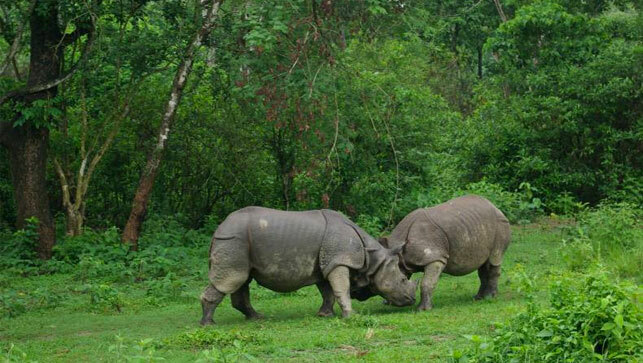 Royal Chitwan National Park covers an area of 932 sq km and it is the oldest national park of Nepal. Established in 1973, it was granted the status of a World Heritage Site in 1984. The RCNP is located at the foot of the Himalayas in the Terai region and this region possesses a beauty that’s totally unexpected in a country known mainly for soaring snow-covered mountains. Royal Chitwan National Park is considered to be one of Asia’s finest national parks popular for dense concentration of wildlife and its top class tourist lodges, which provide the opportunity to see animals in their natural environment. The main attractions are the Bengal tigers and the last populations of single-horned Indian Rhinoceros (Rhinoceros unicornis), but the park is home to at least 43 species of mammals, 450 species of birds, and 45 species of amphibians and reptiles. A few of these animals include leopards, blue sheep, huge buffalo called gaur, sambars, chitals, rhesus monkeys, langurs and two different types of crocodile. The most popular way of viewing the animals is by taking an elephant ride which has an advantage of getting you more in touch with the natural setting. 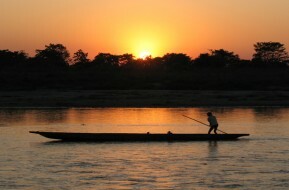 The area used to be known as the Chitwan Valley. It was a place for big game hunting and until 1951 it was a hunting reserve. At the park there is canoeing, elephant rides, and guided jungle walks. Royal Bardia National Park has the country’s second largest tiger population. You can also find rhinoceros, blackbuck antelopes, wild elephant, tiger, swamp deer, black buck, gharial crocodile, marsh mugger crocodile and some rare Gangetic dolphin. Endangered birds include the Bengal florican, lesser florican, silver-eared mesia and Sarus crane. More than 30 different mammals, over 200 species of birds, and many snakes, lizards and fish have been recorded in the park's forest, grassland and river habitats. A good number of resident and migratory birds are found in the park. It is also the home of one of the last known herds of wild elephants. The approximately 1500 people who used to live in this valley have been resettled elsewhere. Since farming has ceased in the Babai Valley, natural vegetation is regenerating, making it an area of prime habitat for wildlife. Royal Bardia National Park is situated in far western Nepal, you will need to have sufficient time since it is not easily accessible like Chitwan. You either need to take a long drive by local bus or an hour flight to Nepalgunj and then around 4 hrs drive to the Park Lodge.